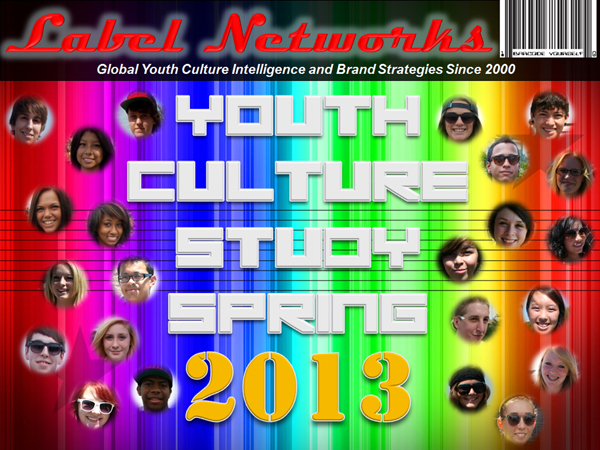 Label Networks’ 13th Annual Spring Youth Culture Study 2013! Published: March, 19, 2013, Los Angeles, CA–Label Networks’ 13th Annual Spring Youth Culture Study reveals new consumer insights from 13-25-year-olds across the United States—the “Recession Generation”–that’s sparking new DIY subcultures, brands, industries, and market trends in spending patterns, social networking, fashion, footwear, technology, music, sports, entertainment, and more. Youth culture in the United States is one of the most important demographics shaping the landscape of the global future not only because of their vast spending power, but because they lead as a primary source of global inspiration for many other youth markets. However, the DIY aesthetics of the 56 million people between the ages of 13-25-years-old in the United States, who are born from a tech-savvy generation before them, has reshaped traditional business models of what once worked just 5 years ago. Trends come from the bottom-up rather than the top-down. Within the 13th Annual Spring Youth Culture Study 2013 lies the quantitative data, insights, analysis, and forecasts that reveal how the identity of a new marketplace coming into their own is re-defining the way brands need to do business. The disruptive nature of a tech-savvy generation living on the cusp of dramatic world change has actually carved out unique niches (often created by the individuals themselves) that have given rise to opportunities and whole new industries never recognized before. These aspects are illustrated within this Study with new brand preference loyalties and online retailers, growing subcultures within sports and entertainment, and attitudes that are re-shaping the shopping and spending habits, personal content creation, and communication. Comparing results for the past 13 years, Label Networks has been able to future forecast within this Study as to where the greatest challenges are ahead, but also new market opportunities which some brands have successfully integrated and moved forward with. For example, while today’s youth culture is undoubtedly the most tech-savvy generation in the world, they also represent a new generation of hope that grew-up with recycling and a broader awareness about the environment, global warming, nuclear threats, and humanitarian issues affecting their world. This demographic offers a fresh set of eyes, attitudes, and opportunities to roadmap key solutions on creating engaging sustainability strategies for their future and many non-profit and for-profit brands tap into this sense of hope and making a difference. “In a first-of-its-kind section, we’ve added the results to a series of questions posed to America’s youth demographic that illustrates their most important Lifestyle Playgrounds ranging from music festivals to tattoo culture to blogging to faith-based group activities, and more. The results provide brands and marketers with an extraordinary amount of detail as to which segments they should be associated with if they intend to connect with the marketplace effectively,” continues Wallace. More specifically, the 338-page Study is based on thousands of interviews from a statistically representative sampling conducted within the beginning of 2013, providing the most current youth consumer insights available. It also delivers far more depth than typical charts and graphs, including detailed analysis as to what the data means, how it compares to the past, forecasts for where things are headed. Data is also combined with comparative analysis that is written, illustrated, and designed for each topic by Label Networks’ Youth Culture Experts to provide a quick snapshot of key findings, including historical analysis, visuals, pull-quotes for fast, effective forecasting, and in some cases, comparisons with Label Networks’ Global Youth Culture Studies from Europe, Japan, and China to provide greater clarity and differentiation. The Study also meters those making content that connects to online communities that are gaining traction within youth culture, but are rarely rated in mainstream industry ratings because the entry point for these growing markets is off their radar. Subcultures revealed here, in many cases, are bigger than entire “rated” industries, for example various YouTube videos, Tumblr Blogs, even Thrift/Vintage Shopping Culture. It is for this reason that our Spring Youth Culture Study 2013 is a vital source for global brands seeking to map-out a unique roadmap for their brand strategies. For businesses looking to create new business strategies from the inside out as they pertain to the youth marketplace, the Spring Youth Culture Study 2013 provides the tools and knowledge to execute feed-forward strategies based on where things are headed, why they’re moving in certain directions, and how to connect to a much more diverse and entrepreneurial youth culture marketplace.